Here is another perspective on the price we have paid to allow the car to wreck our city. Downtown Rochester. South and Court Streets, and the river, in a view from 1936. From Google Earth, at about the same height and scale. 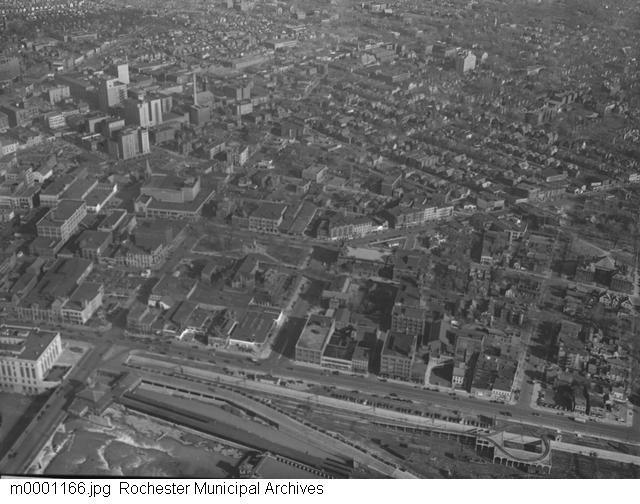 Rochester from the air, 1930. Dense, textured, crackling with life. Cities are living things, changing with each passing day. 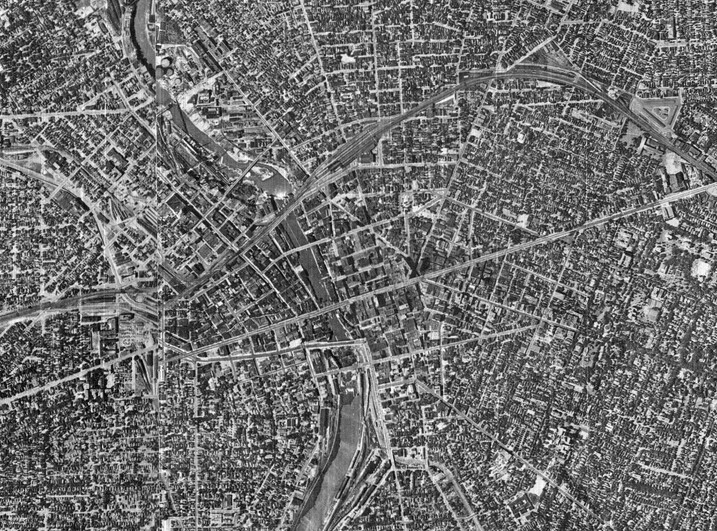 Each old city passes away, constantly replaced by the next city, in layer after layer. Each of these cities tells us who we were and what we cared about. Each layer foreshadows what will come next. This is not idle rhetoric. This is fact. And all of us pay a price for changes in each erstwhile city. Sometimes that price is slight, and the city is better for its changing. If we are paying attention, we might call this progress. And sometimes that price is nearly incalculably high, and neither is the next city better for its changing, nor does it induce other better next cities to follow. Let me explain. Colleague, now Chicagoan, and reader David Steele has helped me by discovering a treasure. 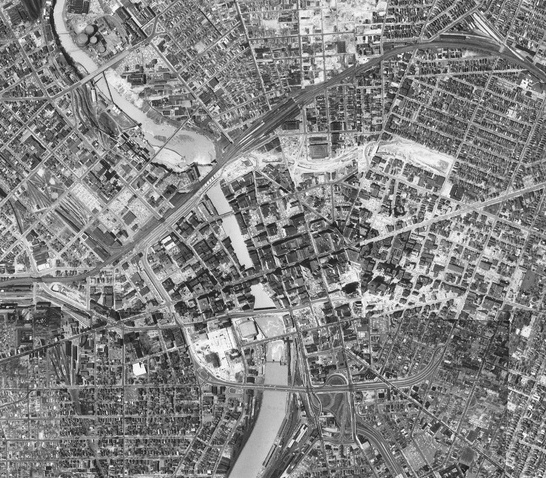 This morning he sent me 5 aerial photographs of downtown Rochester, taken, in turn, in 1930, 1951, 1961, 1970 and 2002. During this period, the city changed, and changed enormously. 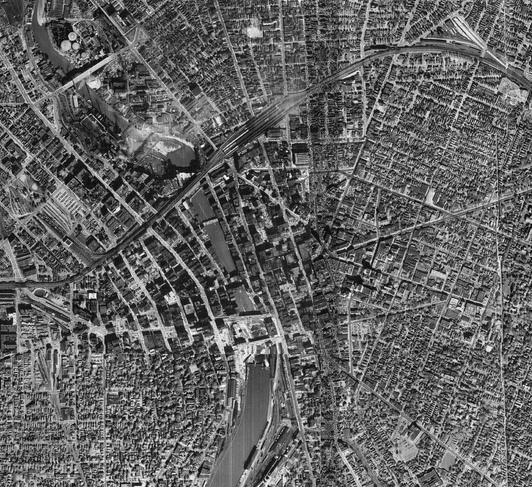 During this period the Inner Loop was constructed. 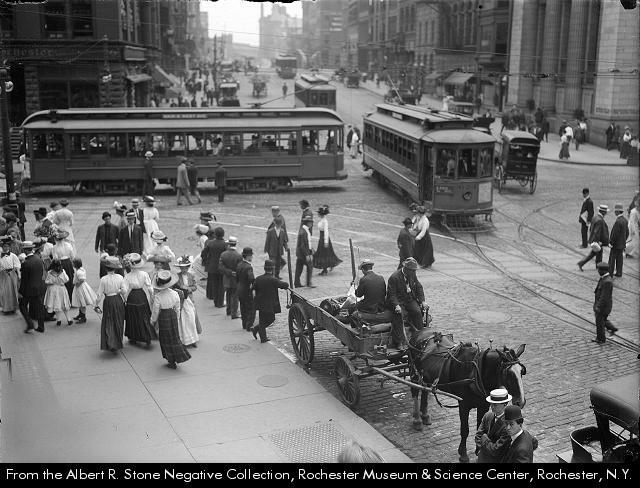 During this period Rochesterians decided that nothing, and here I mean truly nothing, was more important than the car, and car convenience. And in these pictures we can begin to comprehend the urban price we have paid for that desire. You don’t have to take my word for it. You only need to see these pictures. I will refrain from saying anything else. I find these images shocking, and enormously sad. The price has been very, very high. A reader here has just asked me a good question about Rochester urbanism and the character and order of this region: what happened? 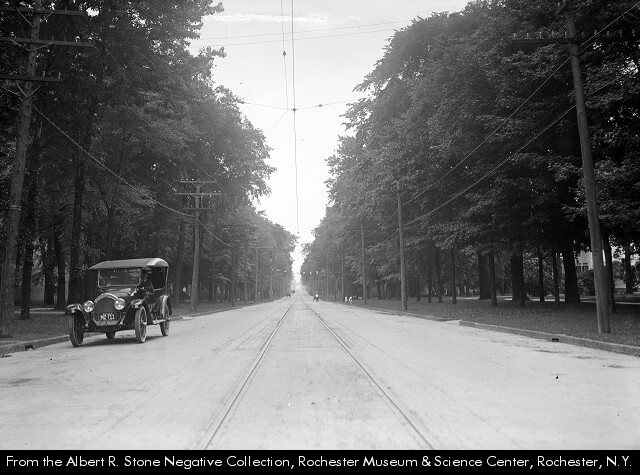 He noted that Rochester was once a dense, compact city, surrounded by neighborhoods of tree-lined streets and lovely homes, in a region rich with all kinds of natural resources – lake, river, countryside. And today – not so much. So, Daniel, here is at least part of what happened. Glad you asked – this will let me get a few things off my chest. I have said some of this before in earlier posts, but I feel like a good rant. Get comfy, because this is going to take a while. First, the car. I once asked a curatorial colleague of mine, and a historian of technology, to try to tell me what the city of the horse was like – the city before cars, and trolleys. 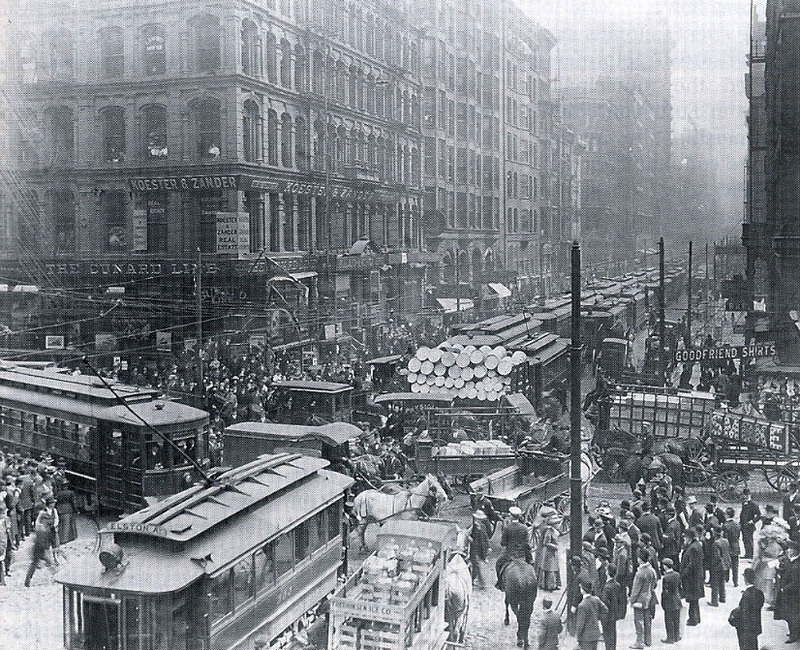 It turns out that that city was pretty dreadful – smelly, filthy, and crowded with big, sweaty, and often sick animals. So when the electric streetcar came along (thanks, Frank Sprague), and later the automobile, city dwellers were enormously relieved. They were happy to jettison their present ills for a horseless future, notwithstanding a blissful ignorance of the almost inestimable price we would pay for a total embrace of the car, and the mobility it provided. Now we know. A city of horses – Chicago in the early 20th century. For the sake of our convenience and in favor of the automobile, we have destroyed the city, and the countryside. 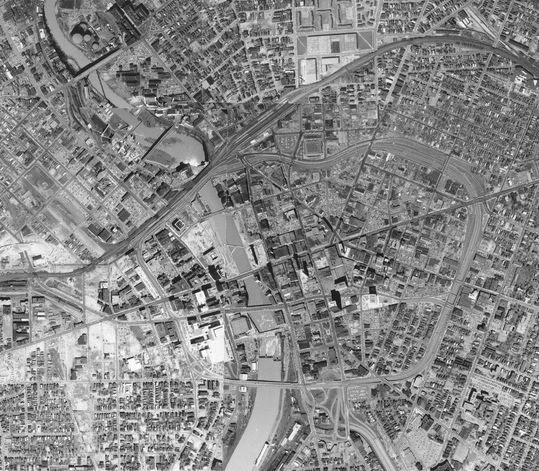 I tried once to make a relatively precise estimate of how much of what was once downtown Rochester was now a parking lot. Once I got to more than 50%, I gave up. 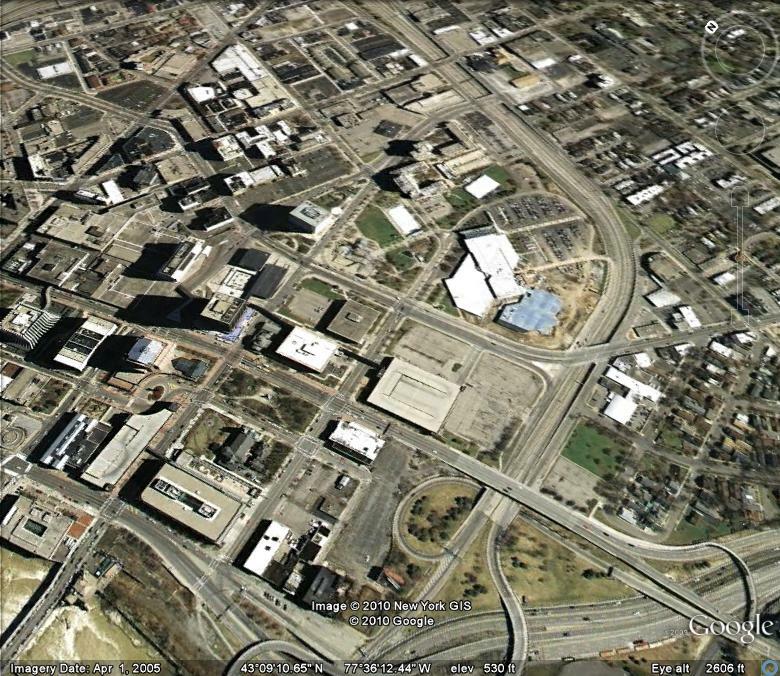 Downtown Rochester, from Google Earth. As another of our readers said recently, “In America we don’t solve social problems, we move away from them.” So the second thing that happened is that it got easier and easier to ignore the poor, the different, the minority, the other. 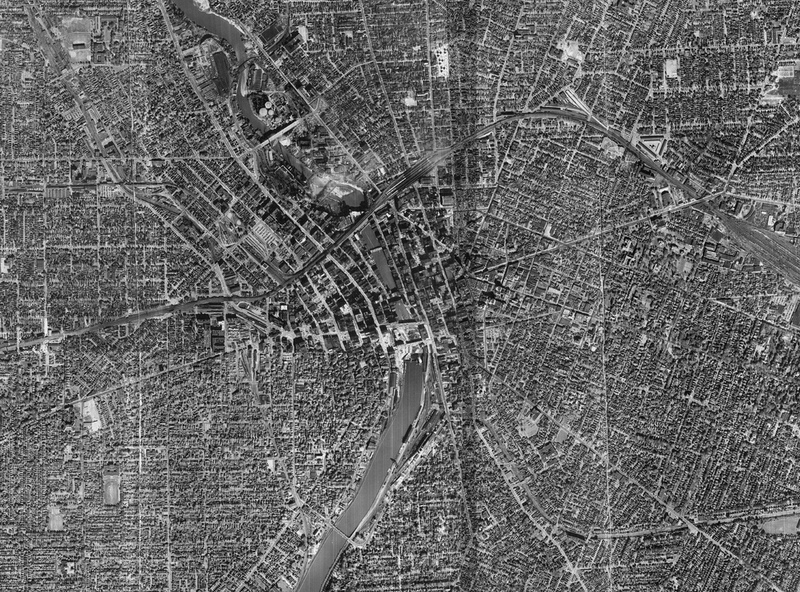 We could just build highways by tearing down ‘their’ neighborhoods, create nearly impregnable barriers between “us” and “them” like the Inner Loop, and drive off into the sunset. The moat. 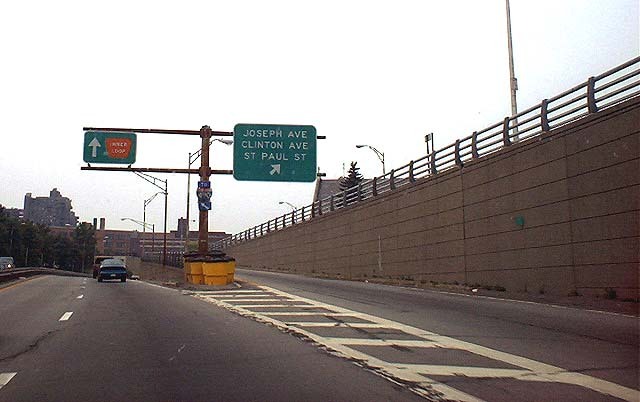 Photo from empirestateroads.com. But unfortunately, there is no such thing as geographical salvation. (Who said that first? Not I). Avoiding our differences, and our varying needs, has proven to be both impossible, and almost unbelievably expensive. And still we have the inequities we had, now principally centered in increasingly abandoned inner city neighborhoods. To illustrate this indifference to social needs, and social equity, just take a look almost any day at the pages of our local paper, the Democrat and Chronicle. From today’s D & C.
I am an outsider, and many locals may think I am lunatic for mentioning this (I may well be lunatic), but this pejorative use of the word city sums up how many in the region feel. I am more than surprised that I hear this quite a lot: the city is the place where crime is, where bad things happen, where poor people, and different people, live. The city is to be avoided, the city is crowded, the city is smelly, dirty, polluted, ugly, dangerous. Come on folks – you’re talking about Rochester here! Get a grip. Cities are our future, and our friends, not cesspools. The best North American cities – Vancouver, Portland, Chicago, Manhattan, Toronto, others – are now seen as places where you MUST live and work downtown. Not in a suburb like Greece, or Webster, but downtown. And how many folks now live in downtown Rochester? About 4,000. But really people, all the rest of downtown is really safe – it’s parking. Onward. The third thing that happened as we found it attractive to spread out all over the place is that we began to duplicate, then triplicate, then logarithmically multiply our infrastructure. More and more expressways and roads, sewers, waste water facilities, libraries, public safety forces, streetlights, signposts, gas lines – you name it. And we did this to the extent that today, we can no longer afford all this stuff. And it’s all falling apart. The physical infrastructure of the civil engineers is crumbling and decrepit. And the attendant social and civic infrastructure is not sustainable either. Just look at your tax bill – we’re maxed out, and constantly arguing about it: what should we close, consolidate, abandon, do without. The fourth thing we did is to mistake innovation for progress. 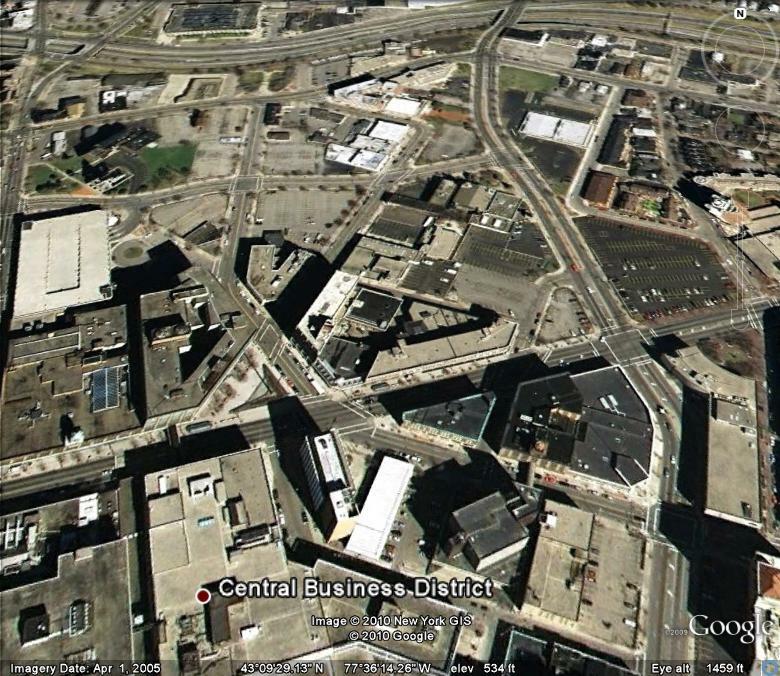 As I said in my most recent post, Rochester has always been a center for innovation – especially technical innovation. People who track such things point to the enormous number of patents that have been registered by Rochesterians over the last century or so. Good. But not enough. It’s a bit like looking through the wrong end of the telescope. Innovation has to be about more than new stuff. Properly, innovation should be about preparing us to lead better lives. And here I mean that a better life is one that increases the common wealth, and the common well-being. Not just a new flat screen or iPhone, but a truly better life – a life that we can be sure will be available to our children’s children’s children. We no longer have that assurance – things are closing in on us pretty fast, and endlessly we read about the shrinking standards of living we can expect in the future. It’s past time to put on our real thinking caps and figure out how to prepare Rochester, or Anycity USA, for what lies ahead. And now I’ll quit raving. But wait – one more thing happened, I think worth noting. Fifth, we abandoned the local. What local? Any local. Local food, local services, local artisans, local greengrocers, local butchers, local clothing shops, local lampshade makers, local anything. I see this so vividly as I thumb through the absolutely extraordinary photo archive of local news photographer Albert Stone. I cherish his archive – it’s an exquisite gift to all of us. His images are powerful testimony to the city we have lost – a city bustling with energy and vitality, and filled with local everything. Why did we abandon the local? Because the local seemed more expensive, slower, less reliable. And that’s how we have defined progress – progress, we say with our consumer dollars, is fast cheapness. And thanks to all the subsidies we put in place, that definition is fulfilled. Subsidize roads, farmers, energy, any of a thousand things we do subsidize every day, and the national or transnational seems cheaper. But it turns out that this cheapness was and is really, really expensive. Much too expensive. How could we have traded Scrantom’s for Staples? Really nuts. 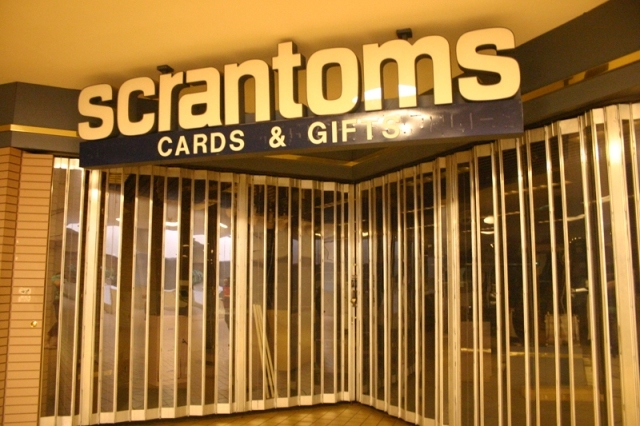 Scrantom’s last stand – Midtown Plaza. Photo from flickr. 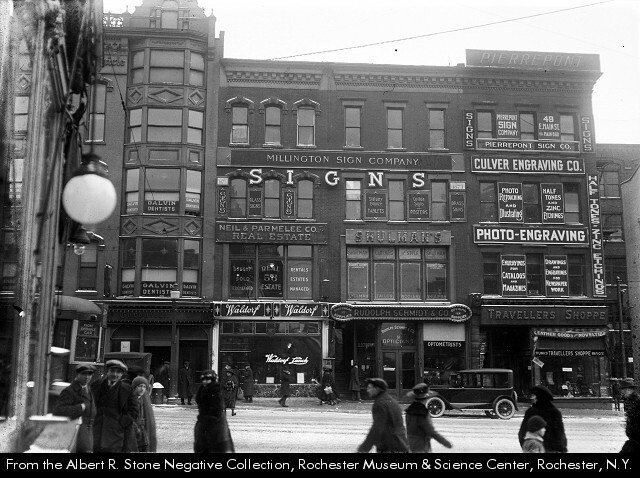 So there you have it, dear reader – five things that happened to Rochester that created the city we have today. Aren’t you glad you asked? I’ll bet you didn’t expect a full-scaled rant from a raving lunatic. Rochesterians enjoy a long tradition of creating the new: cameras, optics, copying machines, telegraphy, and today medicine and science, even corporate R&D (GM has its fuel cell research facility here, as an example). There is and has always been a lot of brainpower here. 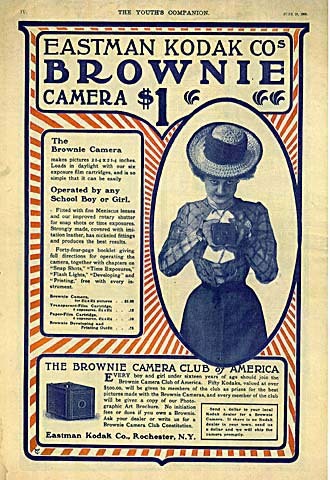 Innovators here have always been good at developing the latest widget, and enjoying the resulting profits. And sharing them – thank you, Mr. Eastman. But the challenges facing this city and its region now require more than the latest widget. The innovation Rochester needs now, in order to enjoy a durable and sustainable future, requires nothing less than redefining progress. Let me explain. I read an extraordinary article the other day on resilience theory and cities at seedmagazine.com. In the course of the piece the writer, Maywa Montenegro, penned two very memorable and telling sentences. The first: “A city’s lifeblood is a continuous flow of stuff.” Energy, water, food flow in. Waste, carbon dioxide, and perhaps innovative widgets flow out. Hmmm. I have thought a lot about this – even written about it here – but that one sentence sums up city life with enormous concision – a continuous flow of stuff, in and out. And the second, even more clear and potent: “No city today could survive on its own resources.” Not one? Nope. So there it is. 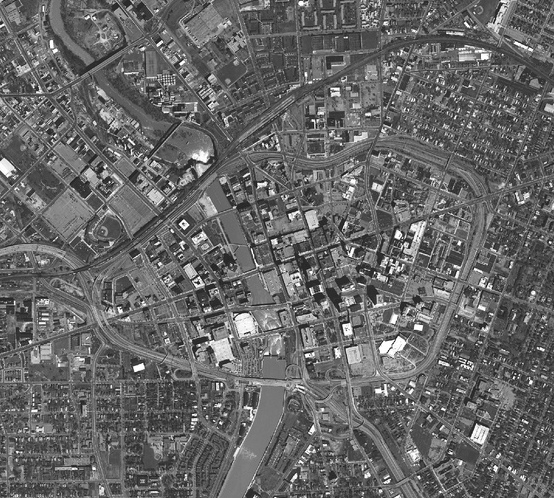 If Rochester wants to be the home of innovation, then let’s figure out how to become a city whose flow of stuff, both ins and outs, is completely the result of our own resources. Sounds like a simple challenge, but in order to approach success, this region would need to rethink and remake nearly everything. Let the innovation begin. We hear every day about shrinking resources, so the need to move our city, and region, toward independence is not as screwy as it might sound. But getting even remotely close to independence, however necessary, would be a staggering task. One example: consider how a city like Rochester could get off the grid, and generate sufficient energy and food to securely and durably sustain itself. Imagine how different this city would be if we accepted this challenge. I suppose that lawsuits about wind turbines would probably cease pretty quickly…. Carless. Obviously, no oil – no cars. Perhaps a local innovator will perfect some kind of personal transportation device that we can power without oil, and can be made from local resources. Otherwise it’s feet, folks. But since mobility is a central requirement in any urban setting, we will need some local innovator to figure out transit options that can propel us from one neighborhood to another. Fuel cell street cars or buses? Solar powered jitneys? Wind powered land ferries? Carless at Main and Fitzhugh, 1910. Dense. 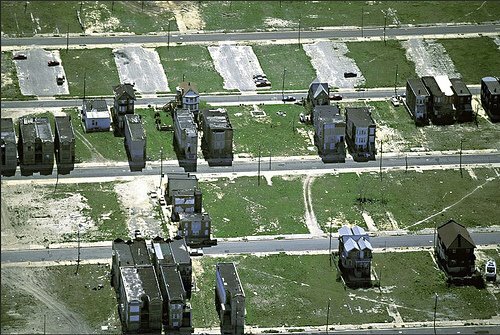 In order to limit energy used for (wasted by) sprawling all over the landscape, we will need to live closer together. There are almost unlimited numbers of studies that illustrate that increased urban density is central to an increase in sustainability – define that word how you will. And since Rochester has almost no alleys, where an increase in density is easy to achieve, I guess we can just start converting our garages into homes. Won’t need that car, anyway. 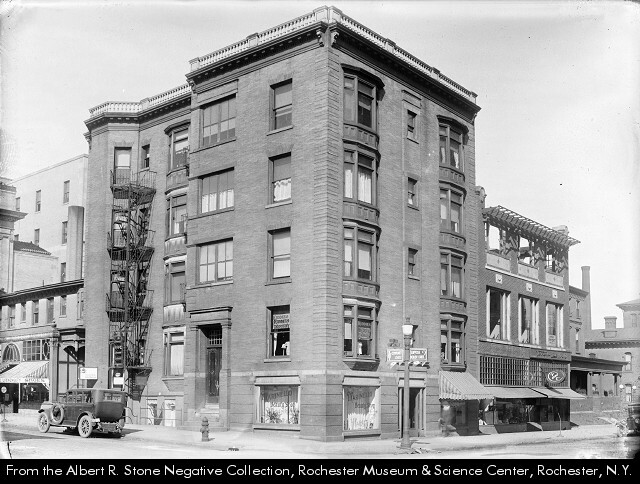 Rare in Rochester – Wentworth Apartments at East and Gibbs, 1925. Nodal. Need a new flat screen? Hop in the car and trundle over to Best Buy. There are two here, both at huge malls. But in the next Rochester, no car, so no trip to Best Buy. Instead, we will gather in neighborhoods, or urban nodes, where there is retail and institutional redundancy – a diverse mixture of uses to support daily life. Maybe some innovator will figure out how to turn the malls and strip centers into sustainable neighborhoods – food markets, health care facilities, shops, homes, schools, and all the other places we need to live our lives. This will need to get repeated in each node or neighborhood. 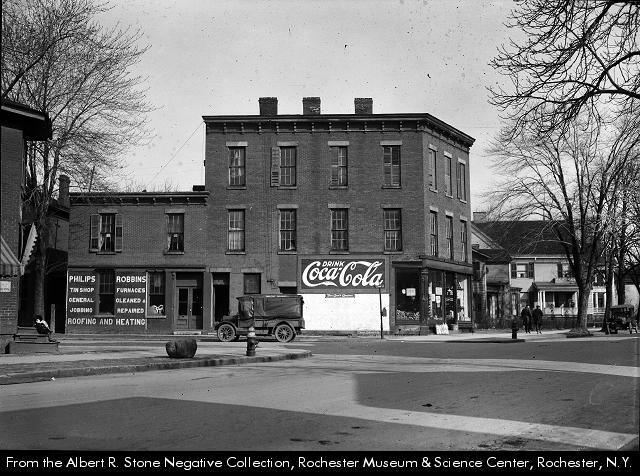 A local neighborhood center – Versage Brothers Grocery and Philips Robbins Tin Shop, Roofing, Heating, 1919. Walkable. 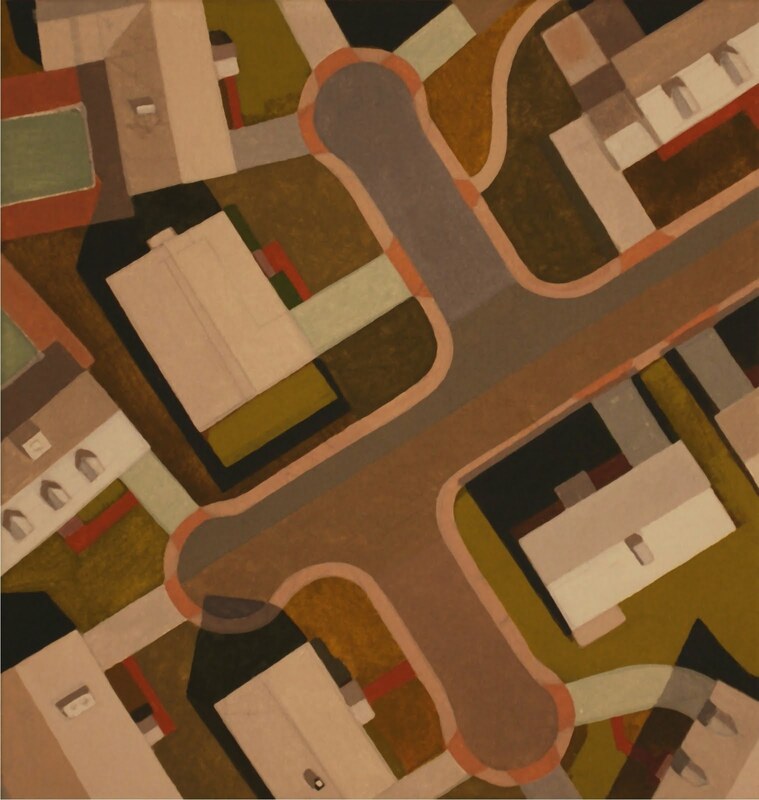 If we are carless and dense and nodal, we must be walkable. Rochesterians pride themselves on the fact that they can get anywhere in the region in 15 or 20 minutes. It’s a kind of standing joke here, you hear it so often. But when we say this, we mean in a car. Imagine a Rochester where you can get anywhere you need to go in 15 or 20 minutes – on foot. Most of us – not all, but most – can walk about a mile in 20 minutes. So this begins to give you a sense of the order of things in the next Rochester – nodes of about 2 miles in diameter. Maybe a wee bit smaller. But you will need to walk to all you need in about a mile in any direction. If you begin to think like this, it’s fun to go to Google Earth and start plotting out the neighborhoods and their centers. Do try this at home. Green. If we must grow what we eat locally, then suddenly that vacant lot down the street becomes a coveted asset. Gardens will spring up all over the place, as will markets. We have a challenging climate here – winter is a bit long, and very white – so we will have to grow our own in the good months, and figure out how to store and distribute during the cold months. 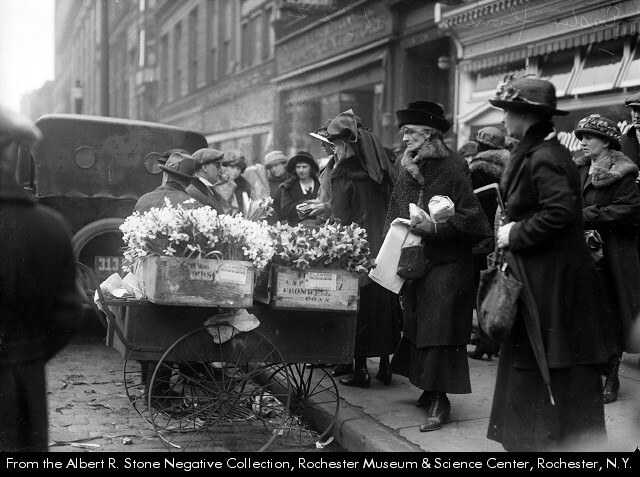 Actually, Rochester has one of the oldest public markets in continuous operation in the U.S. 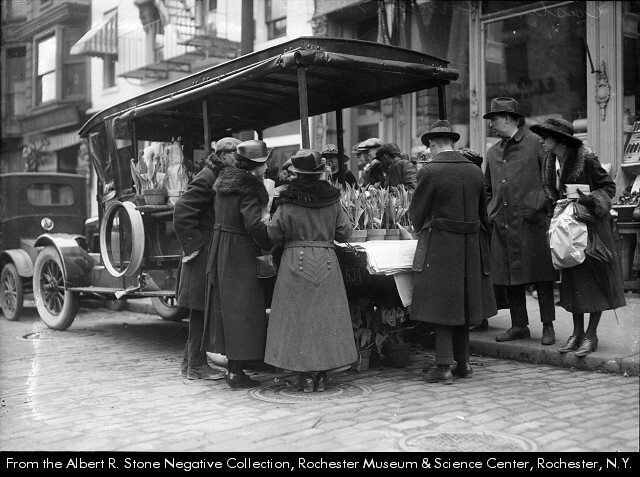 It wasn’t that long ago that Rochesterians used the market, all year around, to purchase all their grub. What we need now is a handful of innovators who can teach the rest of us new ways to craft our seasonal menus with the stuff we have sprouting in the backyard. 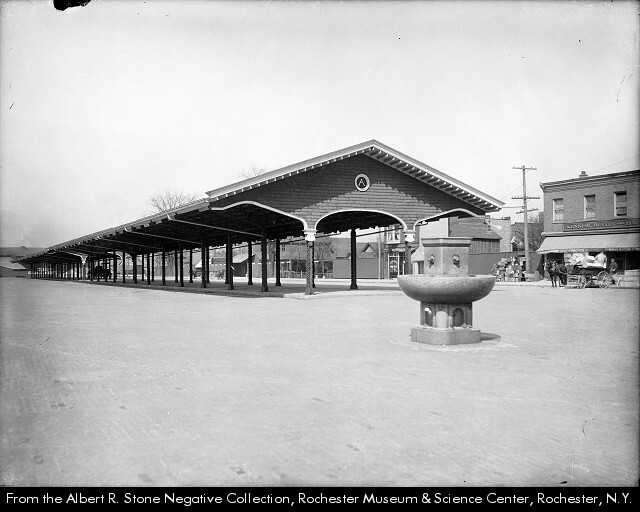 The Rochester Public Market, 1905. Innovators – commence innovating! Oh, but do try to remember that we have done most of this once before. What’s old is new again, I guess. Onward. Maple Ridge Wind Farm, upstate New York – the largest wind farm east of the Mississippi. Photo by Jon R. Vermilye, Lakeshoreimages. New York State ranks 8th in the U.S. for installed and operational power generation from the wind. 1,274 megawatts. This is enough to power over 500,000 households. Or a region the size of, say, Rochester. Good, but a long, long way from really good. For a bit of perspective, there are 19.5 million people in New York State – about 8 million households. This means that about 6% of the state’s households are powered by the state’s wind farms. Obviously we have to build renewable energy sources at a very different scale and rate in order to become truly sustainable and secure as quickly as it is clearly necessary. So it came as a bit of an unhappy surprise to read an article this week in the local paper. 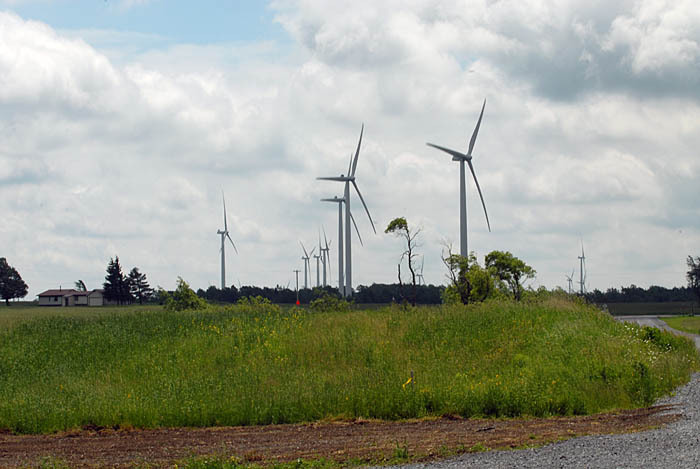 It turns out that residents of counties and towns in the region around Rochester, where a range of wind turbine projects are being proposed, are filing law suits like crazy to stop construction. A lawyer for the opposition claims that he believes “opposition to wind developments is growing.” The most often cited complaint about wind turbines in all the lawsuits: noise. No acid rain, no burning coal, no noisy cooling towers, no railroad cars dumping mounds of coal, no tractors heaving the coal, no dumping residue into piles of slag. And no mountaintops being ripped off or blown up to mine the coal. Come on, people. We have work to do here.